A commenter on my last post correctly pointed out that it might be interesting to look at performance using a percent back based measure on the qualifying times, since the number of racers present can greatly effect finishing place. I didn’t quite have time to pull together the standardization piece that I typically use with distance races (I will definitely do that soon, though…) so this will simply use the percent behind the 30th qualifier. I’m fairly confident that the general picture won’t change much once you standardize those values, but I’ll check once I get that piece organized. 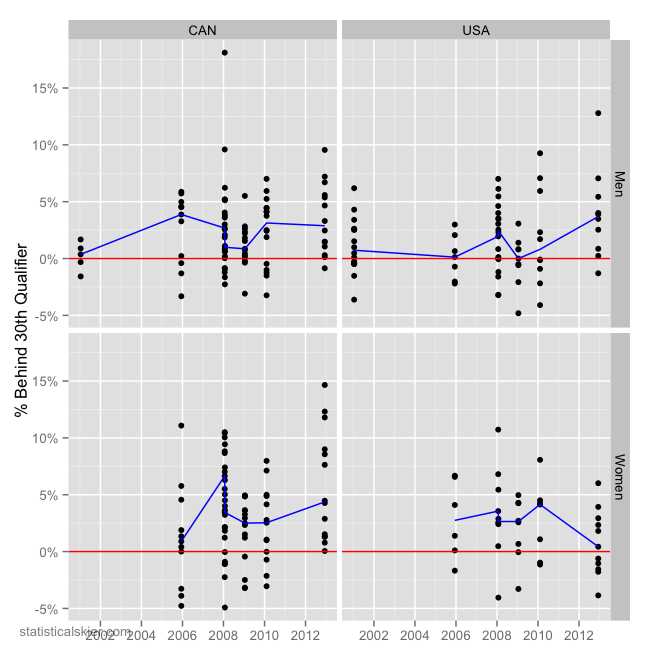 Obviously we can’t directly compare the scales here, but I’d say the overall trends are basically the same: the US men and Canadian women had fairly tough days, the US women were somewhat better and the Canadian men were roughly flat. 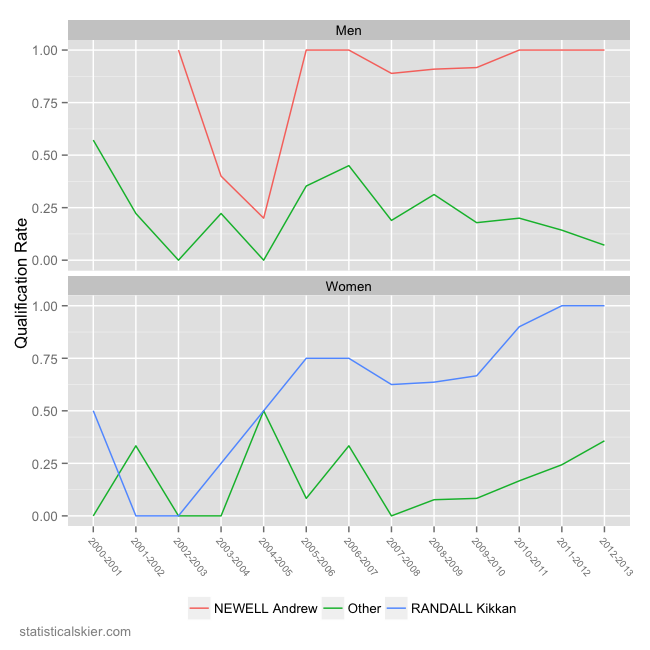 So, just to be clear, the four groups here are Randall, Newell, all other female American WC sprint starters, and all other male American WC sprint starters, and we’re looking at the proportion of times each group advances to the elimination rounds. Posted by Joran on Thursday, December 13, 2012, at 6:00 am. 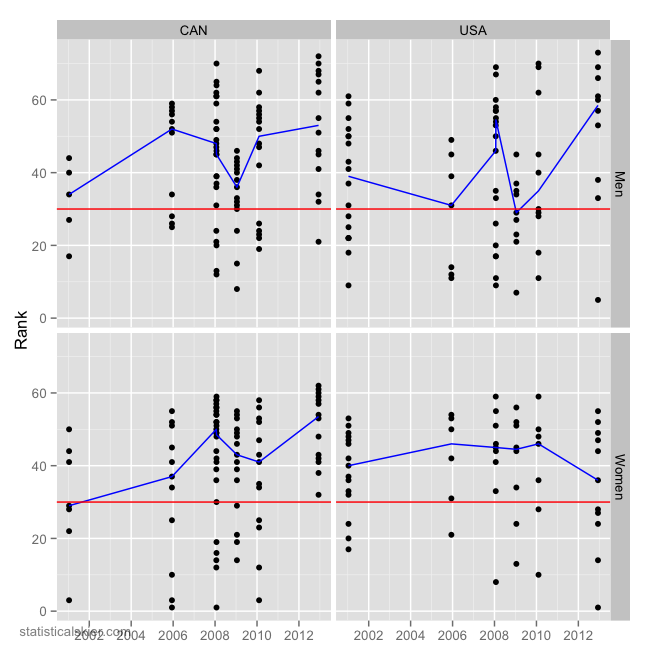 Filed under Analysis, Cross Country, World Cup. Tagged andrew newell, canada, kikkan randall, men, Sprint, USA, women, World Cup. Follow any responses to this post with its comments RSS feed. You can post a comment or trackback from your blog.